Hamas terror group claims victory due to removal of metal detectors from Temple Mount, calls for 'Day of Rage' this Friday. The Hamas terror organization held on Wednesday a march in the Gaza Strip celebrating Israel’s dismantling of the metal detectors on the Temple Mount. 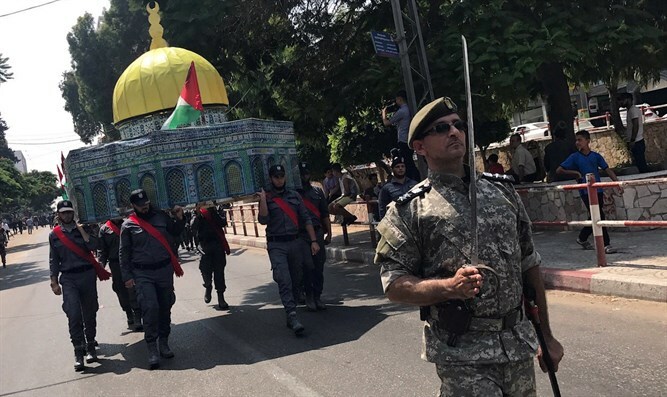 During the march, which took place under the heading of “Victory in the battle over Al-Aqsa Mosque,” members of Hamas’ military wing marched through the streets of Gaza City, bearing Palestinian flags and a model of the Dome of the Rock Mosque. On Monday night, the Security Cabinet decided to remove the metal detectors from the Temple Mount, and the detectors were subsequently taken down, along with the existing security cameras on the Mount. The Cabinet, however, declared that it would instead install “smart check” monitoring technology on the Mount within the next six months, and allocated a budget of up to 100 million shekels for this purpose.